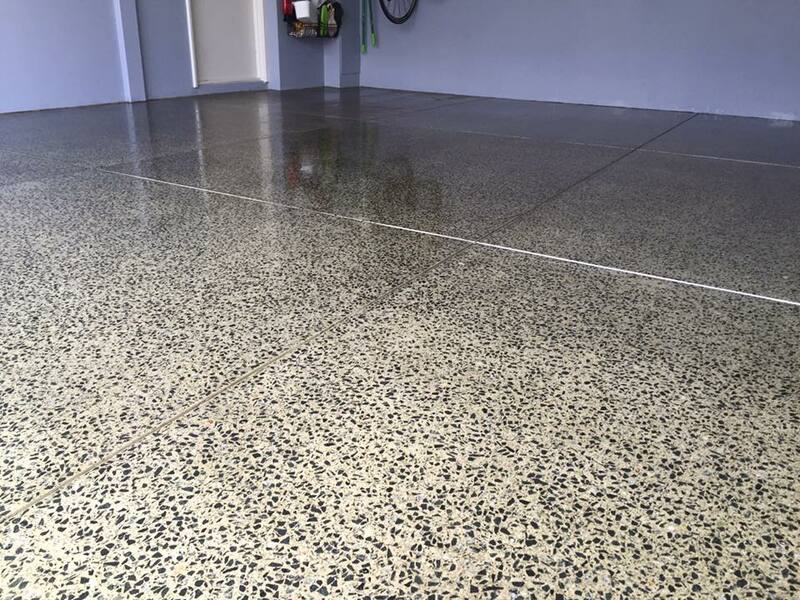 Many homeowners are in the search of cost-effective & easy to maintain finishes making our polished concrete Perth services ideal on cutting cleaning expenses. If you have seen smooth and sometimes shiny concrete, chances are it was polished concrete. This product is fast becoming popular among builders and homeowners due to its benefits. Polished concrete is processed through various mechanically ground procedures similar to the manufacture of terrazzo. Manufacturers utilize a hardener that seeps through the concrete to generate a chemical reaction. This hardens the surface making it dust proof. Eventually, grinding tools are used to polish the concrete and give it the final finish. Specially designed dyes for concrete polishing are normally applied to give the final product a touch of colour. Depending on customer needs, polished concrete can be customized by creating borders, bands, radical lines, or scoring. With several years of experience, our polished concrete floors provide a high-quality finish. What Are The Advantages of Polished Concrete? You can have your polished concrete customized depending on your needs. There are numerous options to choose from at Absolute Scapes. Whether you want a unique colour level or mixes, our team will collaborate with you to satisfy your needs. It comes with a thermal mass capability which helps regulate home temperature both during summer and winter. Polished concrete is ideal for; pool surroundings, bathrooms, and showers. They can also be customized to fit any environment. Today, you can find expert polish concrete services with ease. While many homeowners prefer doing it by themselves, hiring professional services guarantees quality and durability. Absolute Scapes are professional concrete experts with many years of experience in the industry. Having interacted with many customers, we are in a better position to understand your needs, expectations, as well as give you recommendations where necessary. Mixing concrete and grinding it to get the ultimate finish requires a lot of input. Our team of professionals has been in the industry for more than a decade now. We are well versed with this procedure and are committed to executing it perfectly to avoid poor quality finishes and cracking. As a homeowner, you want your finished product to be durable enough to give you value for your expenditure. Professional concrete providers are qualified in their job. They can understand your needs better and can even give you recommendations depending on your specifications. Hiring concrete professionals will help you save money. If you plan to execute the task yourself, you will need machinery and tools which you will probably use only once. Professionals, on the other hand, are prepared for the task to complete with the required equipment. At Absolute Scapes, we strive to provide reliable services to maximize our customer’s experiences. We seek to establish and understand your needs in order to guarantee you quality, durability, and ultimate satisfaction. 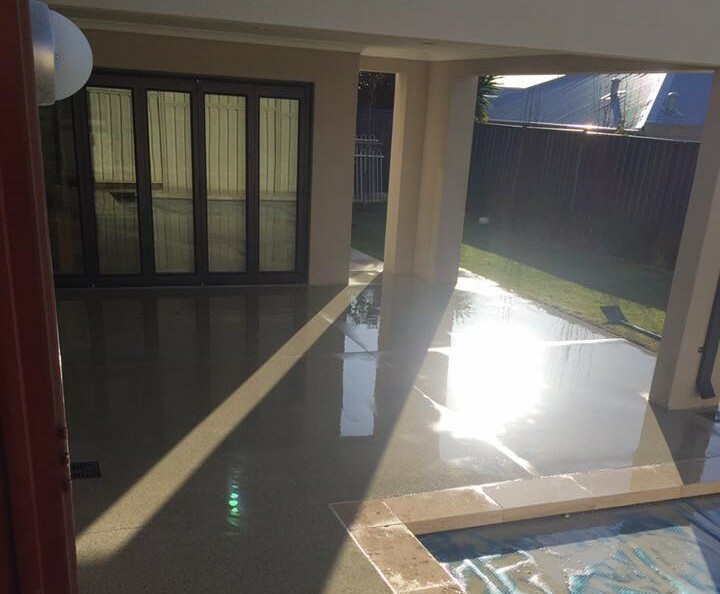 Contact us today, your polished concrete Perth experts. We also provide honed concrete and exposed aggregate in Perth. At Absolute Escapes, we pride ourselves with having many years of experience in provision of polished concrete services. Over the years, we have satisfactorily delivered excellent products and services to our customers spread across and beyond the Perth region. Our company strives to provide a wide range of polished concrete solutions to meet your durability, structural, and aesthetic needs in the surface and hard floor industry. We collaborate with a team of professionals who are qualified enough to provide comprehensive garage floor design and a wide variety of advanced concrete slabs for your warehouse to choose from. Regardless of your project, we shall work together to provide you with the ideal polishing concrete that meets your expectations. 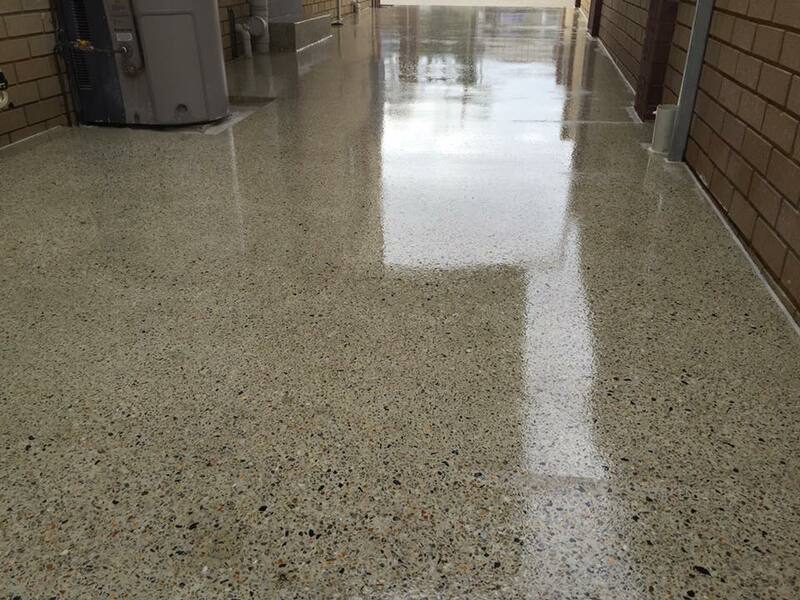 We offer a wide range of polished concrete services and floor coatings as seen below. Does your floor look old? Are you looking for flooring options to improve the aesthetic value of your home? Our team will take you through the numerous flooring coatings we have specially designed for different flooring needs. Once you choose your preferred option, our team will remove the surface of your existing floor in a process we call concrete grinding. We have top of the range flooring materials to prevent cracks on the existing floor. Our team will utilize epoxy floor overlays to fill the surface of your floor where necessary. Whether you want to repair your concrete countertops or are looking to remove unsightly concrete stains, we are committed to providing you will satisfactory services. Concrete floor polishing requires an experienced team that knows what they are doing, using only the best polisher for our clients. Densifying is a vital process in the concrete industry. According to our research, many of the available densifiers in the market today can only harden 2mm of the concrete top. Our densifier, however, is more robust in concrete hardening. By utilizing our services, you can be assured that your concrete overlay will be durable. We offer various flooring material finishes depending on your preferences. Some of which include diamond polishing, polished stone, and other types of concrete floor polishing. Our technical finish and concrete products are designed for wide indoor floors such as warehouses, factories, and storage areas. This finish delivers functionality as compared to aesthetic value. We use the best aggregate materials to create a durable and low maintenance concrete floor for this finish. The technical finish enhances scratch resistance and promotes durability while revolutionizing worn out concrete flooring. You can choose the amount of gloss you require and floor polishing for this finish. This option varies between medium to a high gloss finish and is ideal for indoor public areas and retail floors. This finish is designed to safeguard the polished concrete floor from corrosive materials such as urine and vinegar. This decorative concrete finish is ideal for you if you want an aesthetically appealing hardwearing and functional floor. The superior finish is aesthetically appealing and features a high gloss finish. It’s ideal in areas where decorative concrete is of utmost importance. The superior finish will function well in exposed floors in high-end settings and a wide variety of showrooms. We work with a reputable contractor who is experienced enough to execute this finish according to the client’s expectations. This finish is not only durable, but it’s also easy to clean and therefore staining shouldn’t bother you. Gone are the days when cement and a sealer were used to achieve a favourable floor. Today, there are numerous flooring options to choose from. From high-quality coating floor materials to epoxy floors, we shall collaborate with you to help you actualize your perfect flooring dreams for your facility. Contact us today, your polished concrete Perth experts for superior flooring solutions.